Electrify fences via 110V (plug-in) power with this 0.5 joule energizer kit. A 110v AC or 12v DC electric fence energizer kit used to keep out deer, raccoons and rabbits from garden/orchard areas. It is also used to keep in poultry, cattle, sheep, goats, horses, and guard dogs. Effective at protecting against coyotes, stray dogs, bear and fox. Ground rod and clamp: Galvanized rod does not rust or corrode. 100 ft MaxiShock single insulated cable: It's extra-thick layer of galvanized zinc will protect the connection from rusting for years. Unlike normal insulated fence wire, MaxiShock insulated cable does not require special connectors. 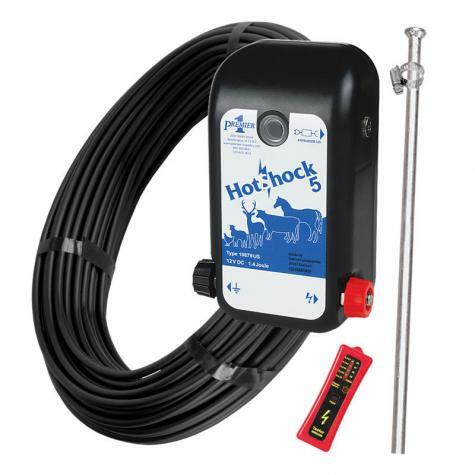 The HotShock 5 can be mounted either inside or outside of a building, but not where there is risk of fire. The energizer must be mounted vertically. Protect the energizer from direct rainfall or flooding. Connect insulated cable (stripped back 1 - 2" on ends) to the fence terminal on energizer, run the cable to the fence line and connect, or use the positive part of the Wiring Harness, not included. Then run a second length of cable from the ground terminal (with ends stripped again) on the energizer to the ground rod, or use the negative part of the Wiring Harness, not included. To attach ground wire, strip the coating off the wire 1" - 2" and make an elongated "U" in the wire. Put the "U" against the rod and put the clamp around it. Tighten. Ground rod and clamp: When installing more than one ground rod, space the ground rods apart 2 feet longer than the rod. Example 3' rods should be spaced 5' apart. Make sure that the probe has not become separated from the black insulated wire. Cup your hands around the body of the tester to keep the sun's glare off the lights of the tester. 42" tall electric fence keeps in chickens and other poultry while keeping their predators out. PoultryNet kits include the net and extra support posts. Recommended: 13 out of 13 said they would recommend this product to a friend. This energizer was simple to install. It literally took longer for me to think about the best place to put it than it did to actually install it. Installed the ground rod, attached the unit to the fence, and turned it on. I've never used an electric fence before, but this was so simple to do, I'm sold. The product was easy to install. Why did you not include a clip for the end of the power wire to connect to the gate. I had to go get a clip to make the gate open more easily vs wiring and unwiring the hot wire. Easy to set up. Hooked it to their poultry 48 inch netting and works like a champ. Younger birds have timed the pulses and when frightened can get out but they slip right back through. Bigger birds have tested it and have learned to stay away. Ended up getting the gate later on and do not know why I did not get it at the same time. Can not live without it. Great products. Easy to wire up and install and works like a charm. I'm using it with a racoon net to protect grapes. Easy to set up. Easy to hook up. Produced the right voltage. Easy to take down. I highly recommend this product.